You are invited to the orchestra concert "7 Candles" & "Year of Czech Music 2014" (Janáček, Kosíková, Dvořák), featuring Czech cellist František Brikcius and Russian conductor Misha Rachlevsky with his Chamber Orchestra Kremlin, held on Saturday 19th April 2014, 7pm, at the Ilya Glazunov Gallery (Volhonka 13, Moscow, Russia). Tickets (400 / 1 000 RUB) available in advance ticket sale. They will perform, in Russian premiere, concerto "7 Candles for cello and orchestra" by Czech contemporary composer and organist Irena Kosíková, who is the daughter of Karel Kosík, Czech philosopher, who managed to survive Terezín. During the Second World War there were many great artists deported to the concentration camp in Terezín. That included murdered Jewish musicians Gideon Klein (1919 - 1945), Pavel Haas (1899 - 1944) and Viktor Ullmann (1898 - 1944). 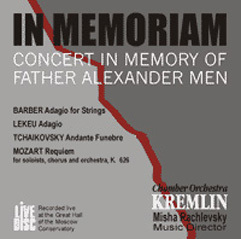 Concert is dedicated to the memory of composers whose perished during the Holocaust. The programme includes Suite for Strings by Leoš Janáček (1854 - 1928), String Quartet in F Minor "American" in orchestra version and Slavonic Dances by Antonín Dvořák (1841 - 1904). 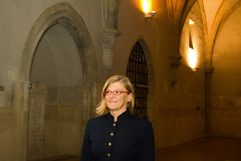 Together with "7 Candles" by Irena Kosíková the event celebrates the official "Year of Czech Music 2014". In the cooperation with the Chamber Orchestra Kremlin and the Czech Centre Moscow. 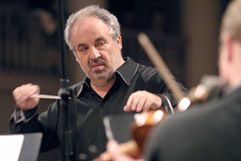 For more details visit websites http://www.Brikcius.com, http://www.iKosik.com , http://www.ChamberOrchestraKremlin.ru and http://Moscow.CzechCentres.cz . "7 CANDLES" & "YEAR OF CZECH MUSIC 2014"
What is the name of the concerto for cello and orchestra written by Czech composer and organist Irena Kosíková? Contest is over, lucky winner is P. J. from Bristol. Prize for the CZECH CELLIST FRANTIŠEK BRIKCIUS NEWSLETTER is provided by Chamber Orchestra Kremlin. 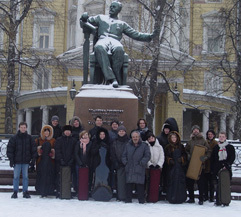 Chamber Orchestra Kremlin, founded and led by Misha Rachlevsky, has earned national and international recognition as one of Russia's leading ensembles. Founded in 1991, the orchestra, comprising some of Russia's finest young string players, has carved a niche for itself under the creative baton of its founder and music director Misha Rachlevsky. Whether it is the highly-acclaimed CDs or its mesmerizing concerts, Chamber Orchestra Kremlin's warmth and high energy create addictive performances that stay with listeners long after the last note has been played. In addition to an active schedule of presenting concerts and festivals in Moscow, Chamber Orchestra Kremlin tours regularly in North and South America, Europe and the Far East. With twenty two years of excellence under its belt, a devoted audience in its home base, Moscow, an awards-winning CD catalogue of over thirty CDs and an increasing demand for performances internationally, Chamber Orchestra Kremlin enthusiastically continues its busy schedule of concerts, festivals, recordings and touring. More details are available on websites http://www.ChamberOrchestraKremlin.ru and https://www.FaceBook.com/ChamberOrchestraKremlin . František Brikcius: Maestro Rachlevsky, you were born in Moscow, you began your musical education at the early age of five with violin lessons, you studied at the Moscow Conservatory and the Gnessin Russian Academy of Music in Moscow. What was the Russian music education like? Misha Rachlevsky: It was - and still is - a very good system. In the music school (this was in addition to the general school) I was lucky to have wonderful teachers and experience environment, very devoted to music. F. B.: In 1973 you left the Soviet Union. Where did you go? M. R.: I went to Israel, and three weeks later I was a member of Israel Chamber Orchestra. The music director at that time was Gary Bertini, but after the audition I saw him only a few times -- in my five months with the orchestra he conducted one or two programs. I decided to move to the USA, but first I needed to earn some money and learn at least some English. So, I signed contract with the Durban (South Africa) Symphony for their short "winter" (June through September) season. One of the guest conductors, Italian Piero Gamba, invited me to join the Winnipeg (Canada) Symphony, of which he was the Music Director at that time. A year and a half later I joined the Detroit Symphony. F. B.: In 1976 you finally settled in the United States. Later you founded the New American Chamber Orchestra (NACO). Was it difficult? M. R.: Looking back - it was a crazy undertaking, to form a full-time orchestra just on one's determination to do it. But at that time it did not seem so - very exciting, yes. F. B.: The same year of the fall of the Iron Curtain you moved to Spain and later back to Moscow. Why? M. R.: The terms, which city of Granada had offered me, were hard to ignore: they fully sponsored my New American Chamber Orchestra for two years and gave me carte blanche for creating a similar formation for them. Yet before the end of that contract I was invited to conduct the Moscow Chamber Orchestra, when President of Claves Records (Switzerland) saw the broadcast of one of the concerts, she offered me to record some Russian-Soviet music and agreed with my idea to do it with the Russian musicians. I was planning to do it with the same MCO, but then came the infamous putsch, and on the wave of euphoria right after it I decided to create a new formation for these recordings. And once we began rehearsing, recording and made a short tour together, it was far too good to leave. And now, 22+ years, about 1,800 concerts in Moscow and abroad and over 30 CDs later, all I can do is to count my blessings. F. B.: What is the origin of the name of your Chamber Orchestra Kremlin? M. R.: Let me just "copy and paste" from the FAQ on our websites: During the Soviet years, performing formations, which were allowed to travel abroad, or perhaps more accurately "sent" abroad, were treated by the government as "political weapons". A dreadful practice, of course, but there was one positive feature for Western impresarios and the public alike – only those of the highest professional order were considered for such trips. Then, in the mid-late ‘80s, Perestroika came, and with it the long-awaited freedom of travel abroad. In no time, fax machines of Western managements began cranking out the offers from countless Russian performing groups, the "ABC Symphony of Moscow" or the "XYZ Russian Chamber Orchestra", offering very attractive fees for concerts by orchestras which at times existed only on those very faxes, and then were hastily put together right before tour departure. Well, soon the West learned that Russia was the land not only of the Richters, the Oistrakhs and the Rostropoviches. When I decided to start a new orchestra, I did not want it to be mistaken with any others, so I was looking for a name which would not have "Moscow" or "Russian" in it, yet would clearly identify our origin. Looks like it worked. F. B.: What is important for you when planning a concert? M. R.: There are great many variables - acoustics of the hall, projected audience, what else is scheduled for the given period / cycle of concerts, wish of the presenter (if it is not a concert, which we produce on our own), availability of certain soloists, etc. No, I don’t want to say that this is a difficult task - it is one of the greatest benefits of my job. At the end, the difficult part is to select, what to leave for some other time. But there is one common thread - I never conduct music, in which I don’t see a strong tool for communication - with my colleagues, musicians, with the public, and, if you pardon the pathos, with certain powers, that rule our lives - and no, I don’t mean the government. F. B.: Recently you returned from the concert tour in the United States. How was the audience there? F. B.: On Saturday 19th April 2014, you will be in Russian premiere, conducting concerto "7 Candles for cello and orchestra" by Czech composer Irena Kosíková together with the music by Leoš Janáček and Antonín Dvořák, celebrating the "Year of Czech Music 2014". What is your relationship to Czech composers? M. R.: Very simple - I love them. My first disc for Claves - the company, which in some ways became the God-mother of our orchestra - was with music by Janáček, Suk and Dvořák (with the above-mentioned Chamber Orchestra of Granada). Dvořák is as a staple of our repertoire as Tchaikovsky. F. B.: What are your future plans? M. R.: Sorry, I am superstitious. F. B.: Have you experienced anything nice recently? M. R.: Lots of things! The question is too broad, so it is a very eclectic mix - met some new and interesting people, discovered my relatives (they found me) I never heard of before, ate in wonderful restaurants, read and reread some books, including Kafka (no, not in preparation for the Czech program, just for my pleasure ;-), learned new music - and looking forward to adding to this list by working with František Brikcius, on Seven Candles by Irena Kosíková. F. B. Thank you for provided answers. 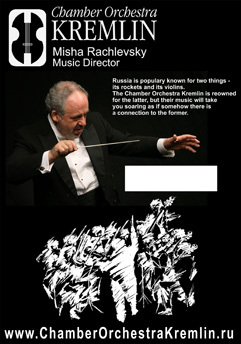 For more information about Russian conductor Misha Rachlevsky visit websites http://www.Brikcius.com , http://www.ChamberOrchestraKremlin.ru and http://EN.Wikipedia.org/Wiki/Misha_Rachlevsky . For new video every month (1st Thursday) subscribe Czech composer and organist Irena Kosíková on YouTube http://www.YouTube.com/IrenaKosikova . Now complete performance of all 18 Leipzig Chorales by Johann Sebastian Bach (1685 - 1750).